“Money” Mayweather has hinted on social media he was pocketing $9 million for the fight, meaning he earned around $4.5 million per minute for the spectacle. 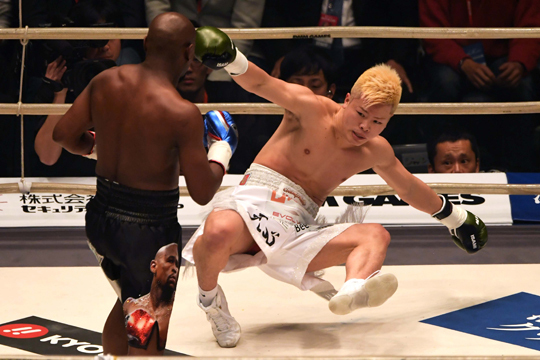 The rules were very strictly defined: three, three-minute bouts and boxing only -- kickboxer Nasukawa was reportedly facing a $5 million fine if he aimed a kick at Mayweather. “This won’t go on my record. This won’t go on Tenshin’s record. Tenshin is still undefeated. I’m still undefeated. This is just entertainment for the people,” he added. The purse for the event was not disclosed but “Money” hinted on Instagram that he would be making $1 million per minute. “What if I told you I was making $9,000,000 for nine minutes of sparring in Tokyo, Japan,” he wrote on his official page. “Would you do the same if you were me? I like to call it a nine-minute walk-thru,” the post added. Mayweather, a legend in the boxing world, has a perfect 50-0 record with 27 knockouts. He won world titles in five different weight divisions and was considered the best pound-for-pound boxer in the sport. Promoters RIZIN have hailed him as “perhaps the best combat sports prospect the country has ever seen” and the 20-year-old himself had claimed he has a “punch that boxers don’t have”. But he hardly penetrated Mayweather’s defenses and barely made the older man break sweat. There are also unconfirmed rumors Mayweather could take on reigning UFC lightweight champion Khabib Nurmagomedov, who said last month any match-up would be “twice as interesting” as the McGregor fight. Monday’s Tokyo fight was on-off from the start. It was announced out of the blue on November 5, with Mayweather saying it had “always been a goal of mine to go outside out of the US and display my talent”. Mayweather said he had been “blindsided” into the contest by the organizers. But the promoter flew to the US to meet Mayweather and announced a week later that the fight was back on, saying that a “misunderstanding” had been resolved.